Although it’s missing a community pool and spa with a game room, this looks pretty nice for my future retirement home. Except for inclement weather, you’ll likely find me sunning on the back porch, with a laptop and a cooler, waving to passersby, before the local constabulary asks me to move. This entry was posted on Monday, 28 December 2009 at 12:05 AM and is filed under Automotive, Babe Magnet, Bizarre, Cool, Humor, Like Not., Retro. You can follow any responses to this entry through the RSS 2.0 feed. You can leave a response, or trackback from your own site. It is great to view life as positive and fun as possible, when you choose to be in childlike mood, you stay young, charming, and healthy..
Hey Bunky. Hope you had a great christmas. I lost your email so could send it there. amy– Ditto to you. Did you look behind the couch? That’s where I find all my lost things, mixed in with the cat stuff. This thing makes me feel right at home. 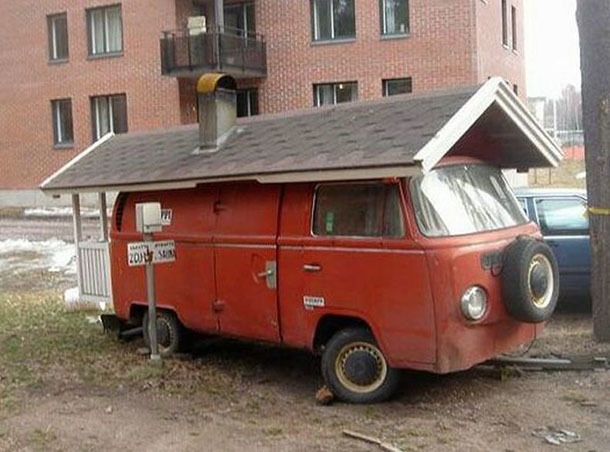 I used to stay at a rather ramshackle RV park that actually had a vehicle with a roof over it like this. 1389AD– It’s all about getting back to the basics. Cooler, microwave, LGF socks, what more do you need? Oh yeah. Food and a warm place to take a think.